This graphic illustrates how atmospheric carbon dioxide is produced during cellular respiration and combustion and then taken up by plants. Students apply what they have learned about the processes of photosynthesis and respiration to label parts of the graphic an answer questions. This activity is probably best done as a pair-share activity or a group discussion project to reinforce photosynthesis and respiration topics or could even be used as a way to introduce the topics. 1) Fossil fuels are formed in the geological past from the remains of living organisms. Petroleum products, such as coal and natural gas are considered fossil fuels. Why are these types of fuels considered NONrenewable? 2) When animal and plants die, microorganisms, fungi and insects are responsible for decomposition. These organisms also respire. Show an arrow on the diagram to indicate respiration by decomposers. Explain how you attempted to find how many of Birds and insects were in the ecosystem eg grasslands ? I’m not sure I understand the question. Some of the questions in the activity are meant for discussion purposes, and there aren’t exact (correct) answers. I do not have one handy, but I can make one this weekend. Do you have a school email address where I can send it? Can I have the answer key to this worksheet? 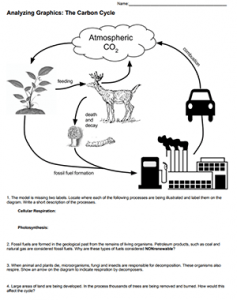 This answer key is available for purchase at https://www.teacherspayteachers.com/Product/Analyzing-Graphics-Carbon-Cycle-Key-3911090 for $1.00 Proceeds go to support this site.